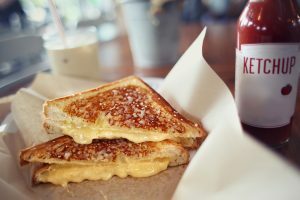 The American grilled cheese sandwich came to be in the 1920s when sliced white bread and American cheese were prevalent. This humble sandwich has come a long way, but remains an overwhelming favorite across the US. What qualifies as a true grilled cheese? Purists will say a grilled cheese is simply cheese, bread and spread, mainly butter. However, grilled cheese sandwiches across menus have exploded with over the top and decadent fillings. Check out some creative ideas for both the purists and the rule breakers. You don’t need to stick with plain old white bread to make a grilled cheese. Whether you just want to try a different sliced bread, or you want to opt for a completely different vessel, below are some options for creative carriers for your grilled cheese. You don’t have to leave your bread naked! There are options beyond butter. Below are some flavor pops to add to the exterior of your grilled cheese. Even if you want to shy away from loading your sandwich with outrageous toppings, you can still add some flare with unique, high-end spreads. Sometimes nothing beats a grilled cheese with sliced tomato, but sometimes you’re looking for something a little more. Here are some veggie options to elevate your grilled cheese. Anyone can put bacon on a grilled cheese, but given the right cheese, there can be a variety of other protein options out there that make the perfect sandwich. Below are some trending protein options perfect for dressing up your grilled cheese. We hope that we have given you some ideas for building a more interesting grilled cheese. Get to melting!